Usually cats are finicky about what they eat so many people won’t ever have problems with leaving houseplants in reach. However, poisoning from household plants makes up a large volume of the calls that the ASPCA hotline receives. Here is a list of some of the houseplants that make our cats sick and can very possibly cause death. This succulent is known for its healing properties and making our skin smooth. It is dangerous to cats. While it may not cause death in small quantities symptoms include vomiting, diarrhea, lethargy, loss of appetite. To keep your indoor cats safe put the aloe plants outside where they can’t be reached. Delicate in appearance it is not so delicate when ingested by a cat. Baby’s breath often accompanies floral arrangements making it a household peril to pets prone to eating anything. If you get a flower arrangement with baby’s breath, toss it out before placing the flowers on your table. Baby’s breath causes vomiting and diarrhea which can be fatal if your cat becomes dehydrated. Although it is not a true lily the calla lily is just as dangerous as the real thing. Calla lilies and their family members can cause intense burning and swelling in your cat’s mouth. This can in turn cause difficulty in swallowing – which can then lead to choking, aspiration, or closed airways. The brazenly beautiful and aromatic lily hides a dark secret – it is highly toxic to cats. It can cause kidney damage and failure and may bring about death in as little as 18 hours. While Asian lilies are seen on most toxicity lists it’s best to keep lilies of all varieties away from your felines. For example, the distant relative, the amaryllis, is also dangerous. A fall and winter favorite, the poinsettia can come in a variety of colors. Ingesting poinsettia can cause irritation of a cat’s mucous membranes. Even though the vibrantly hued plant gets a lot of bad press for its toxicity it is not the most dangerous household plant for cats. The sweetly pretty and romantic tulip causes a range of symptoms if eaten by a cat. Those symptoms include vomiting, diarrhea, lethargy, and hypersalivation. While all parts of the plant contain toxicity the bulb is the most poisonous part. Hypersalivation, otherwise known as drooling, is a big red flag for poisoning. Other signs and symptoms include extreme lethargy, depression, loss of appetite, and an off-balance gait. Because so many of these symptoms are also linked to other illnesses it’s important to monitor your cat’s activities. One way, if your cat isn’t vomiting, is to look at the plants around the house. If they show signs of being nibbled on that is a sure sign that a pet has been eating it. When you suspect your cat has eaten a poisonous plant you can call the ASPCA hotline but chances are you’ll need to take her immediately to the vet. Outside of business hours contact your local emergency vet. Don’t throw out all your plants, though. Remember that most plants aren’t highly toxic, at least in small amounts. If you like to decorate your home with greenery, there are a lot to choose from that won’t harm your cat. 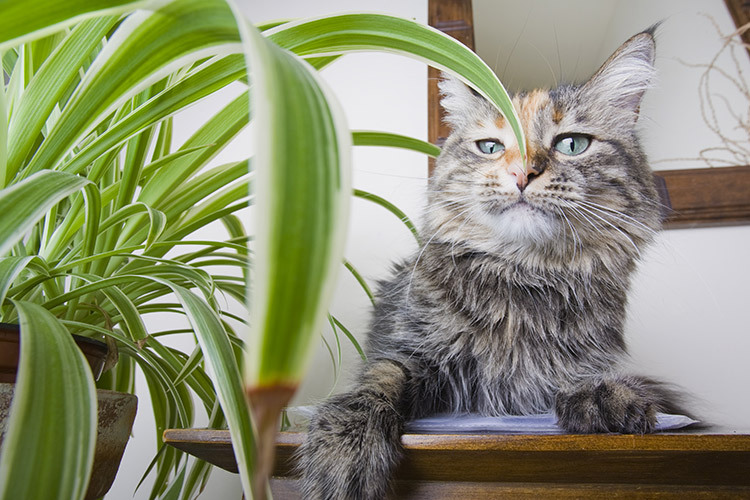 Pet Health Network: Why Do Cats Eat Plants, and Should I Be Worried?